All passengers were transferred to another ship and were safe; however the incident was a haunting precursor to a coming disaster. The building where the White Star Line did business was relatively new. As the 19th Century ground to a close, the New York Central and Harlem River Railroad Company’s freight depot sat across from Bowling Green at the base of Broadway where, years earlier, the Atlantic Gardens, a Victorian amusement spot had stood. 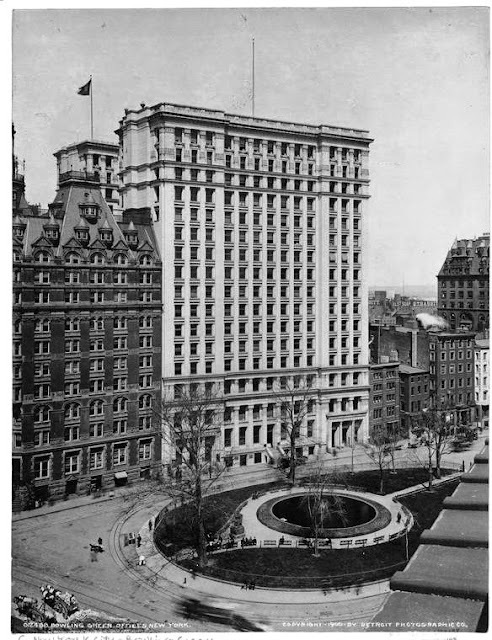 In 1895 Stacy C. Richmond purchased the site and, with four other businessmen, formed the Broadway Realty Company with intentions of erecting a major office building. To design it, the group commissioned the relatively unknown architectural firm of W. & G. Audsley – two Scottish brothers, William James and George Ashdown, who had immigrated from London three years earlier. The developers wanted a state-of-the art show-stopper. When it was completed three years and $1.8 million later in 1898, it was exactly that. With an imposing gray granite base, the white brick Bowling Green Building Offices Building at 5-11 Broadway rose 16 stories above the park. White terra cotta ornamentation graced the façade, termed “Hellenic Renaissance” by the Audsleys. It was, they said, “a free but pure treatment of ancient Greek architecture.” A central court provided ventilation and light; and the latest conveniences such as electricity and elevators quickly attracted tenants. On the upper floors were a restaurant and private sleeping quarters with sweeping views of the harbor. 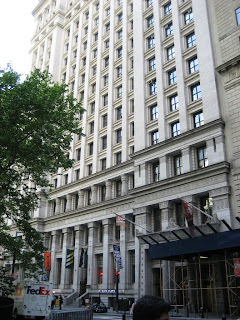 Because of its location at the base of “Steamship Row” and its convenient proximity to The Customs House, the building filled with steamship companies and related businesses; The White Star Line, The American Line, The Merchant Marine Committee of the Whole and the offices of the U.S. Navy’s Supervisor of Shipbuilding, were early tenants. Representing non-steamship concerns was the office of The Central Council of the National Sound Money League. Here, on March 28, 1899, representatives nationwide met to vote on the proposed gold standard for the dollar. In 1906, the Erie Railroad Company took the third through fifth floors – approximately 76,000 square feet of office space. The White Star offices were crowded “from booking rail to booking rail” and the park across the street was filled with agonized friends and relatives. Three years later, on September 3, 1915, seven elevators simultaneously fell within the Bowling Green Offices, “creating a panic and giving their passengers a bad shaking up,” as reported in the newspapers. Seven months later, in April, four elevators plummeted again. 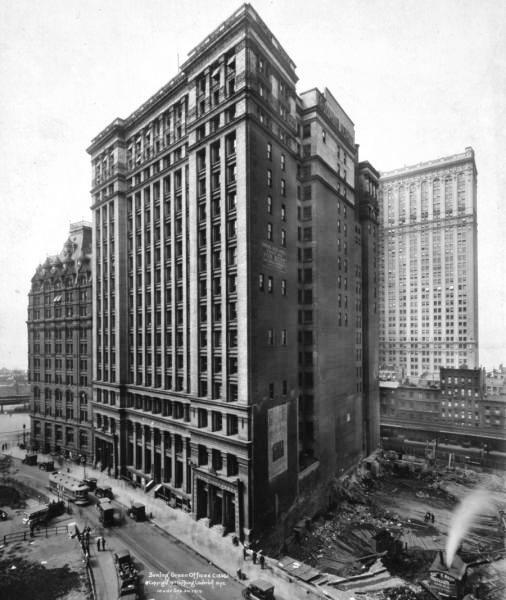 Between 1919 and 1920, a four-story tower was added, designed by Ludlow & Peabody. The firm’s design, so conscientiously sympathetic to the original, is imperceptible. Towards the end of the 20th Century the hulking building showed its age. 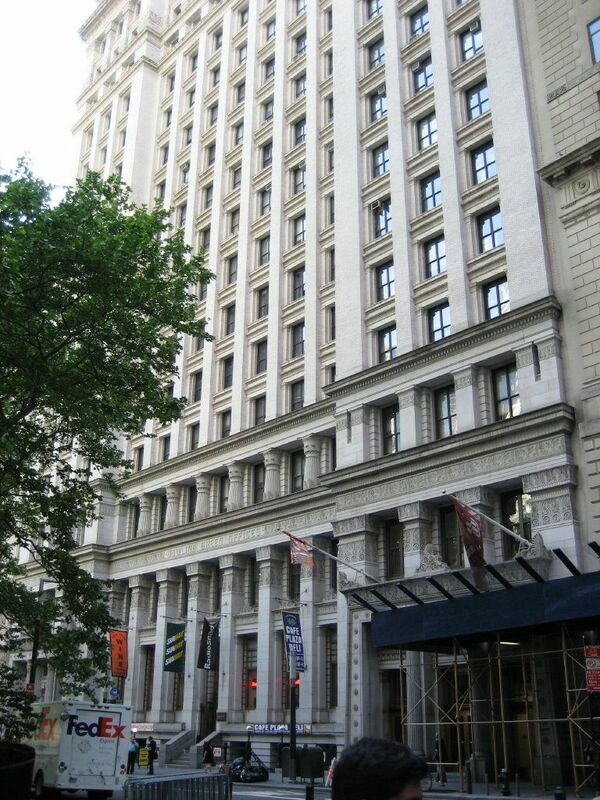 Although stock speculator Ivan F. Boesky, who would end his career in disgrace, held 9500 square feet of office space; high-end tenants were moving out. Within a few years the Bowling Green Offices Building would have a mere 10 percent occupancy rate. Things changed, though, as dot-com businesses sprang up. By early 2000 the building was 98 percent filled; mostly with new internet firms like Commissioner.com, WealthHound.com, Moving.com, and Stockback. Rents more than doubled and the address has regained its lost prestige.